When Garden Girl was really little and first became aware of her shadow she was scared of it. She would walk along trying to detach herself from it, standing still, demanding that it go away. Garden Boy, on the other hand, has always been on the very best terms with his shadow. He looks for it when we walk along, waves to it and runs with it, so when the sun came out one morning last week we went out specifically to play with our shadows. It is a good time of year to play with your shadow because the sun is lower in the sky and the shadows are longer. We walked along beside our shadows, holding hands and watching as they copied, holding hands themselves. 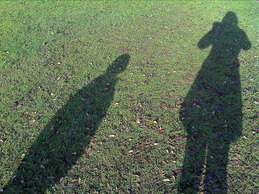 My shadow was pushing a pushchair just like I was and when I started jumping up and down my shadow did too. Garden Boy waved at his shadow, giggling as it waved back. They ran, jumped and danced together, then played peekaboo over the top of a wall's shadow. We watched as our shadows hid in the dappled shadows of a tree, unable to see the whole shadow, but seeing a shadowy movement all the same. 'It there!' 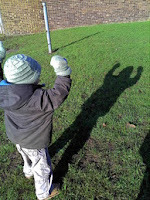 Garden Boy shouted as he spotted his shadow moving, followed by 'It gone!' when it hid beneath a solid shadow. We tried, very hard, to get our shadow to walk on the other side of us, but it would not. Garden Boy made himself dizzy, turning in circles, trying in vain to step over his shadow and move to the other side of it. I explained why the shadow would not move but I'm not sure he cared. He was having far too much fun playing with his grey friend and he was very impressed when I took photos and we looked back through them, guessing which shadow belonged to who. I now have a mission to take pictures of all his friends shadows so we can mix them up and play a matching game with their actual photos. And I have to admit that I was rather pleased to see my own friendly shadow waving back at me and copying my silly dance moves - no-one else in their right minds would copy my dance moves, so I have a soft spot for my shadow who joined in with as much energy as I did!